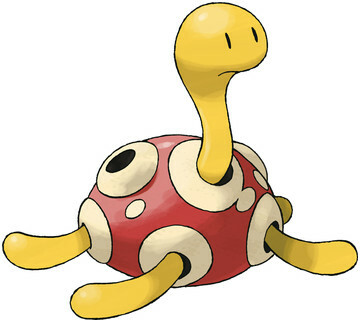 Shuckle is a Bug/Rock type Pokémon introduced in Generation 2. It is known as the Mold Pokémon . The ranges shown on the right are for a level 100 Pokémon. Maximum values are based on a beneficial nature, 252 EVs, 31 IVs; minimum values are based on a hindering nature, 0 EVs, 0 IVs. The effectiveness of each type on Shuckle. In Generation 3, Shuckle does not have the Gluttony ability. In Generations 2-4, Shuckle has a base experience yield of 80. The BERRIES it stores in its vase-like shell decompose and become a gooey liquid. It stores BERRIES inside its shell. To avoid attacks, it hides beneath rocks and remains completely still. The fluid secreted by its toes carves holes in rocks for nesting and can be mixed with BERRIES to make a drink. SHUCKLE quietly hides itself under rocks, keeping its body concealed inside its hard shell while eating berries it has stored away. The berries mix with its body fluids to become a juice. The BERRIES it stores in its vaselike shell decompose and become a gooey liquid. A SHUCKLE hides under rocks, keeping its body concealed inside its shell while eating stored berries. The berries mix with its body fluids to become a juice. It stores berries in its shell. The berries eventually ferment to become delicious juices. The berries stored in its vaselike shell eventually become a thick, pulpy juice. The berries stored in its jar-like shell eventually become a thick, pulpy juice. Shuckle learns the following moves in Pokémon Ultra Sun & Ultra Moon at the levels specified. Shuckle learns the following moves via breeding in Pokémon Ultra Sun & Ultra Moon. Details and compatible parents can be found on the Shuckle egg moves page. Shuckle can only learn these moves in previous generations. It must be taught the moves in the appropriate game and then transferred to Pokémon Ultra Sun & Ultra Moon. Note: Generation 1 and 2 refer to the 3DS Virtual Console titles, not the physical cartridges. Shuckle learns the following moves in Pokémon Sun & Moon at the levels specified. Shuckle learns the following moves via breeding in Pokémon Sun & Moon. Details and compatible parents can be found on the Shuckle egg moves page. Shuckle can only learn these moves in previous generations. It must be taught the moves in the appropriate game and then transferred to Pokémon Sun & Moon. What is a good moveset for Shuckle? Where Can I Get Berry Juice? Is there any way to do even more damage? Sturdy or Contrary for Shuckle? Would a Set Damage Move KO a Pokemon with Sturdy? Is this a bad way to use Shuckle? Can you get a Berry Juice by giving an Oran Berry to Shuckle? Can Shuckle still make RC in the PC?